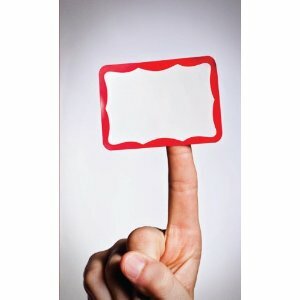 I recently got the chance to review the book The Nametag Principle, by Scott Ginsberg - a guy who's been wearing a nametag for the last 10+ years. In the vein of Seth Godin, Tim Ferriss, and Ramit Sethi, Scott has boiled some truths about marketing and branding down to their very essence, and compiled them into a book of daily thoughts about how to connect with people in a real, authentic way. January 20: Be not humiliated by having others see you truly. "My clients hire me because I'm a person - not a personality." February 2: Bother to do things. "To come. To call. To stay. To ask. To reply. To say hi. To clean up. To give it some thought. To include people. To learn their names." February 9: Calm comes from experience. "There's nothing more calming than communicating your mutual humanity." February 20: Come out swinging and you'll be perceived as a threat. SO TRUE! This is one I've had to learn repeatedly in my own life - my instinct at having been "wronged" means I go firing off to a company or colleague or loved one, only to find that there's just been a mistake or miscommunication. Oops. Note: I did read through the entire book! It just so happens that most of the anecdotes that really stood out to me were at the beginning. Part of this reason is that much of the book is repetitive, sharing the same idea in a different way. This is to be expected - even desired! - in a title that's intended to be read in short bursts, every morning or evening or whatever. (Unlike the way I read it, in two sittings.) That repetition helps to drive home the point, and many of these points are really good. I work in marketing and I've done a lot of these types of branding brainstorming sessions, webinars, and workshops. Much of it is nearly impossible to put into practice, because it ignores what Scott drives home again and again: it's about people. The only downside about this book is some language - it does come off as authentic (if a bit immature), but it's unnecessary. It distracts me from the message, and would make me think twice about sharing the book with some people who I think could use it but who I know would be offended. I don't consider myself a prude, but I also don't like the use of profanity, vulgarity, and slang in books for professional growth. Otherwise, I thought it was a neat little book full of useful ideas presented in an interesting way. If you like books about using marketing/branding as a tool for connecting with people or using your brand to connect with your customers, this is a good book for getting ideas percolating. Thanks to the author for providing me with a copy to read. I was not compensated in any other way for this post, and my opinions are my own.